Mr. Asfaw has more than 20 years of experience with Ethiopian Airlines, having first joined the company in 1987 as a Systems Engineer, responsible for the preparation of engineering orders (EO) for the modification of B767, B757 and ATR42 aircraft. 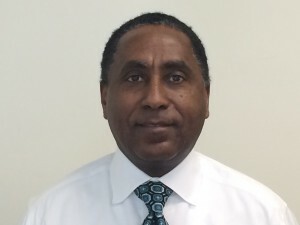 Since then, Mr. Asfaw has gone on to fill such senior positions as Promotion and Customer Services Division Manager, Passenger Sales Manager – Addis Ababa, Ethiopia, and most recently served as Passenger Revenue and Capacity Management Director. A frequent guest speaker at the Ethiopian Management Institute, Mr. Asfaw holds a Master of Science degree in mechanical engineering from Vorishilograd Machine Building Institute, Ukraine, and an MBA from Rollins College, Crummer Graduate School of Business. TRO: Tell us about your role at Ethiopian Airlines. TRO: What do you find most rewarding about your job at Ethiopian Airlines? KA: I find meeting new people, be it new customers or partners such as travel agents, the most rewarding part of my work. I am on the road often, this allows me to meet all kinds of people from all walks of life. TRO: Ethiopian Airlines has been around doing great things for more than 60 years. What can you attribute to this longstanding success? KA: We invest a lot in people: in attracting new talent, training them, and on retention. I am myself a good example of that. I joined Ethiopian in 1987 right after college and I’ve been with Ethiopian all these years aside from the time I went to graduate school. TRO: What is Ethiopian Airlines’ relationship with travel agents? KA: We are firm believers that travel agents are our business partners and our customers. We always try to adhere to this idea as our guiding principle in all of our daily transactions with travel agents. TRO: What has been an obstacle Ethiopian Airlines has had to overcome in expanding? KA: Ethiopian Airlines’ biggest struggle in expanding has certainly been cultural differences. Although we’re now a billion dollar company and fly to over 74 international destinations, we want to have the nimbleness and flexibility of a small company as our organizational culture. That is not easy when you fly to so many countries and employ staff from around the world! TRO: Do you have any advice for travel agents that may be struggling to sell Africa as a destination to clients? KA: Experiencing a destination is incredibly helpful in selling it. From what I have observed, agents who have traveled to Africa themselves and have a firsthand experience of what Africa has to offer to a visitor. This in turn gives them a better chance of selling to a customer. TRO: Is there any new and exciting news or happenings on the horizon for Ethiopian Airlines? KA: Yes! We are brainstorming the possibility of adding more US gateways. We’d like to focus on the West Coast.